Looking for the best bottomless brunches in London? Well you’ve come to the right place. 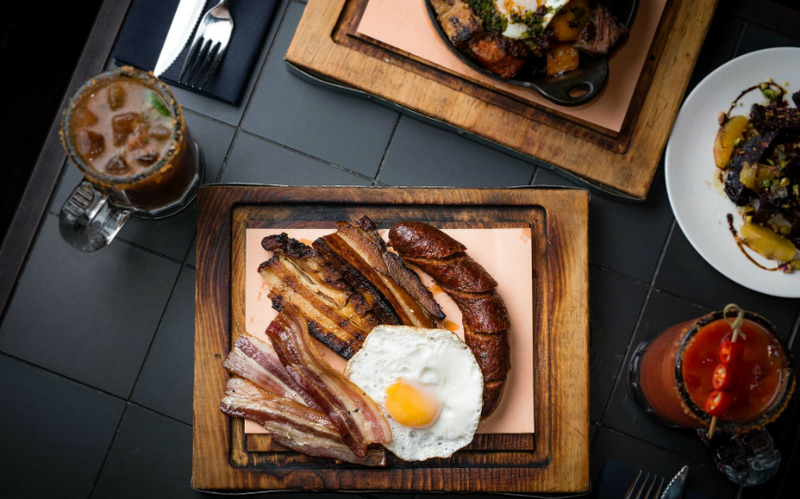 Regular brunch is all good of course but sometimes only a limitless supply of mimosas will get the job done, and luckily London is home to a whole array of brilliant bottomless brunches. If you’re going to try and drink as much as possible in two hours, it’s a good idea to eat well, so our favourites not only have great booze but great food too. 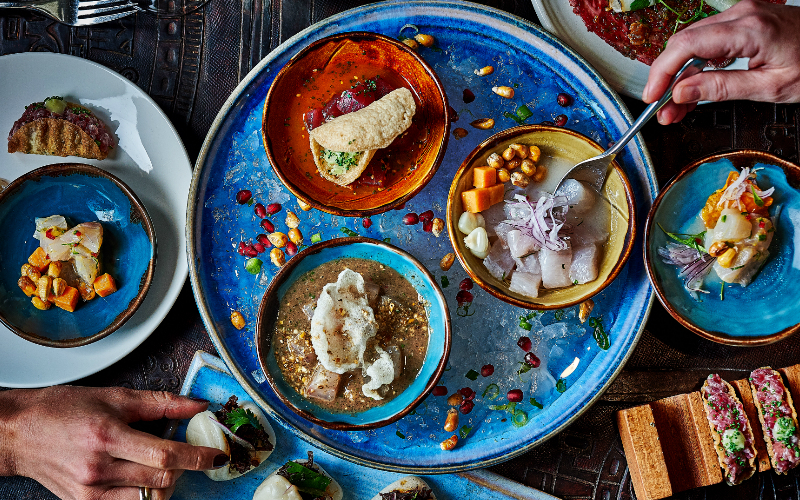 Our guide has all the best boozy brunch spots in the city from Mexican feasts in Dalston to sophisticated champagne fuelled menus in Mayfair. Whereas bottomless brunches in London used to be pretty limited in their scope, there’s now more choice than ever. At Shackfuyu in Soho for example you can get green tea waffles with unlimited pineapple sake. If it’s free flowing Pisco punch you’re after then Señor Ceviche has got just that, alongside its menu of Peruvian dishes. If you’re looking for a more traditional bottomless brunch, then there’s plenty of those too. At Hix in Mayfair you can choose from Bloody Marys, bellinis or champagne in limitless quantities to go with you’re smoked salmon and eggs. And at Dalston’s Jones and Sons there’s a whole load of prosecco as well as bottomless food too – just see how much avo on toast you can eat in two hours. Whether your in need of a real hangover buster or celebrating a special occasion, we’re spoilt for choice. So without further ado, and in no particular order, here are the best bottomless brunches in London. Flesh & Buns specialises in Japanese drinking food so you can bet they know how to do a bottomless brunch. 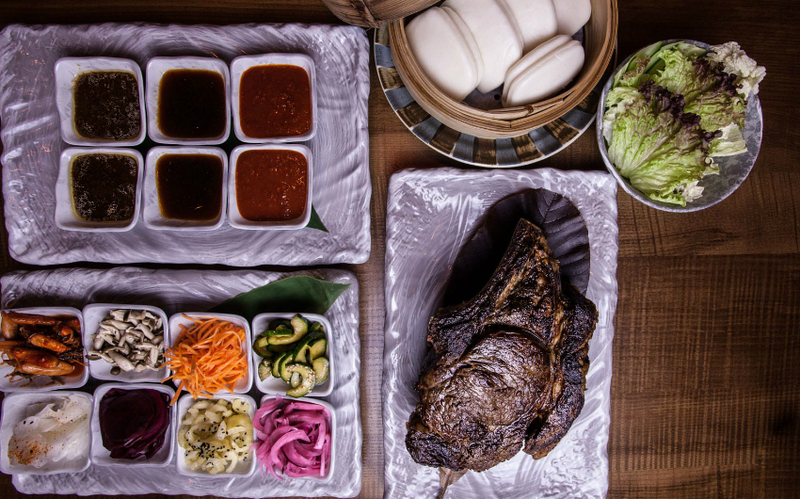 You get a choice of sushi and sashimi small plates as well as one flesh, like ribeye steak or crispy duck, per person to go with your buns. They round it off with big sharing desserts, hello s’mores and chocolate fondant, and free flowing vino or prosecco. Calling all taco lovers! Breddos Tacos are spicing up Sundays and putting a Mexican twist on the usual bottomless brunch, offering customers an hour and a half of bottomless tacos. For only £25pp you can get as many of their tasty tacos as you want, including the baja fish and egg, avo and salsa molcajete. And it wouldn’t be a bottomless brunch without some booze, so you can also choose from an hour and a half of bottomless frozen margs, Pacifico Cerveza or a classic michelada, for only an extra £20pp. It’s available from 12pm – 5pm at their Clerkenwell branch as well as the Soho one, so you’ve got no excuses. 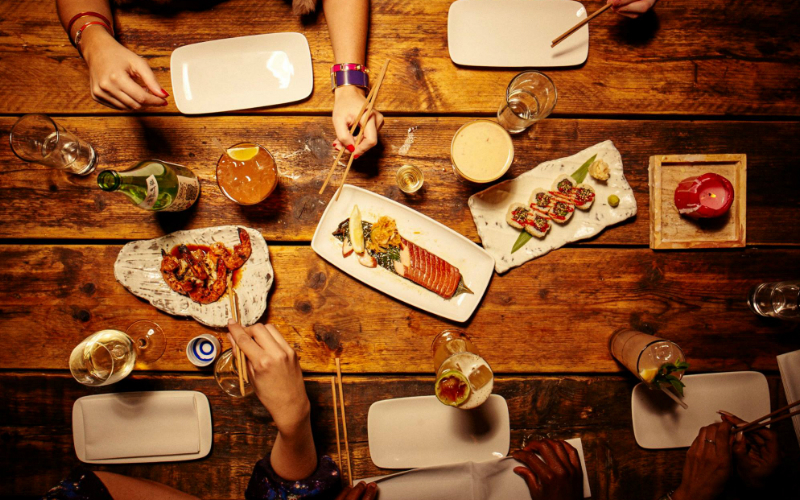 Not only does the Marble Arch branch of Kurobuta do unlimited drinks at brunch, it does unlimited food too. That’s right, you can go back to their buffet of sushi, sashimi, fried chicken, build your own ramen and more as many times as you want (or can), and they’ll keep on topping up the drinks whilst you do. Save some room for dessert too; they bring out a mega fruit platter for afters. Build your own benies and unlimited Moet are just two of the reasons to pop down for Le Brunch at Coq d’Argent. The Oeufs, poached eggs, smashed avocado and crushed hazelnuts on toast is another and then there’s the star of the show…The Gauffre au bacon- that’s homemade waffle, crispy streaky bacon, fried eggs and maple syrup. On top of the sippin’ on champs and forking through food, there’s a lively atmosphere with a DJ and roaming saxophonist as well as those amazing views from their rooftop garden. 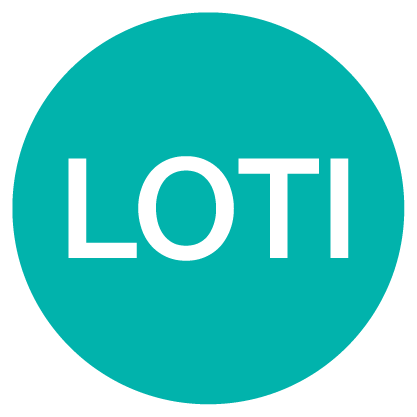 Le Brunch is available every Saturday from 11.30 to 3.00pm and is priced at 2 courses for £26.50 or 3 courses for £29.50. Unlimited Moet et Chandon can be added for £40 per person. If you’re looking for a bottomless brunch with a party then Coya Angel Court is the place for you as the Amazonian-themed brunch combines food, booze and dancing to create one of the liveliest brunches in London. To start you’re invited up to the starter station where you’ll find a huge selection of ceviche, tacos, beef tataki and salads. You’ll also get a generous portion of guac which is made at your table and chips to dip. The main course is your choice of classic Peruvian dishes and we’d recommend saving room for dessert as the buffet is brought out once again with a selection of sweet treats including fresh churros and brownies. Spirit packages start at £65pp and get you 3 hours unlimited cocktails (espresso martinis, margaritas, bloody marys and pisco sours), or you can get the Perrier Jouet champagne and cocktail package for an extra £10pp. Once brunch is coming to an end and the food is served, the party kicks in with live music and acts every week so come with your dancing shoes on. 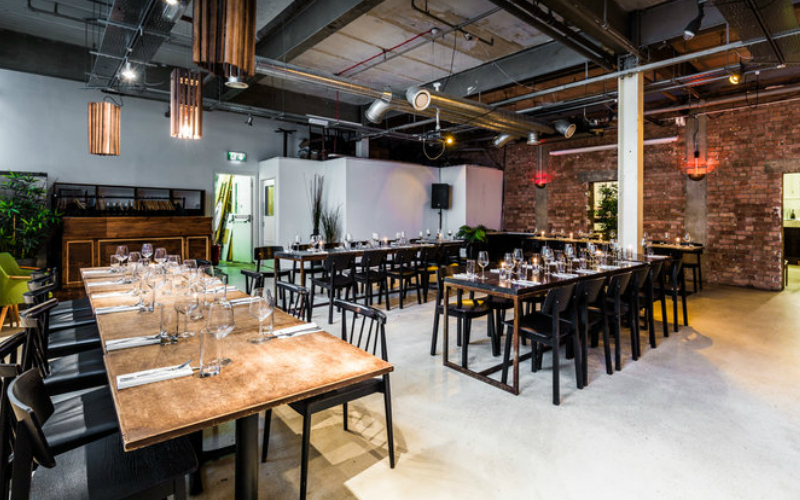 Farmer J have recently launched their ‘build your own’ bottomless brunch at their new site on King William Street and its exactly what it says on the tin. With a range of mini dishes on offer you can choose between three, five and seven each and ‘build your own brunch tray’. These include brunch classics like shakshuka along with dishes you wouldn’t usually see on a brunch menu, such as charred flank steak with green tahini. Booze-wise you can choose from an hour and a half of free flowing prosecco, harissa Bloody Marys or the fiery house michelada. They do bottomless brunch a little differently at Shackfuyu. The menu is packed with Western-inspired Japanese food, so you get dishes like green tea waffles with smoked bacon and black sesame butter, bo ssam beef short rib and their insta-famous kinako french toast with matcha soft serve. You can wash it all down with prosecco but unlimited pineapple sake is the real way to go here. And if you’re feeling particularly naughty, you can even go bottomless on Mondays. If you wanna get off the wagon, the bottomless brunch at Hix Mayfair should defo be on your hitlist. It all begins with an old school drinks trolley which delivers endless Bloody Marys, bellinis and champagne to your table. The menu features Hix’s most ordered breakfast dish, Albemarle smoked salmon ‘Hix cure’ with scrambled Burford Brown eggs as well other light starters before going full throttle with the mains like Wiltshire ham and Montgomery’s Cheddar toastie and Moyallon sugar-pit rib of beef with spring slaw and champonzu. Don’t forget dessert; we’d recommend the Peruvian gold chocolate mousse and more champers, of course! Pasta Remoli is bringing an Italian feast to London with their new bottomless brunch menu. For those who haven’t heard of Pasta Remoli before, the Italian restaurant founded by Roman chef Simone Remoli, is known for making all of its pasta on site and serving it up in a quick yet authentic way. 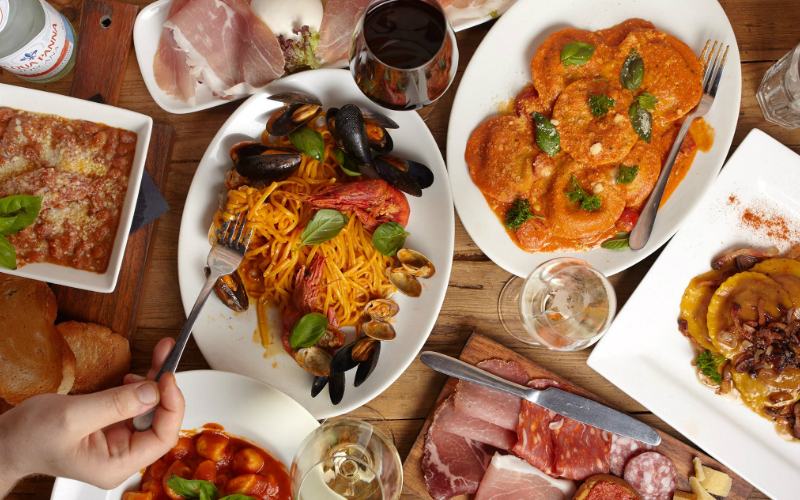 With prices for the bottomless brunch starting from £25pp, guests get antipasti Remoli for two, which includes a mega cheese and salami selection, arancini, bruschetta and bread selection, followed by a choice of pasta and any Remoli Roman sauce. Booze-wise you’ve got the choice of 1.5 hours of unlimited D.O.C Prosecco or Aperol spritzes. The bottomless brunch is available from 11-4pm every Saturday and Sunday at their Finsbury Park and Ealing branches, so grab your amicis and head down for a bottomless Italian extravaganza. If you thought Señor Ceviche was good before, then wait ’til you get a load of their boozy brunch menu…sweet potato waffles with slow-cooked short rib, frijoles negros and a fried duck egg, and corn bread french toast with burnt tomato salsa, avocado and yuzu truffle hollandaise, HELLO. Cough up an extra £18 and enjoy free flowing Pisco Punch, Pisco Marias or Cusqueña beer too. 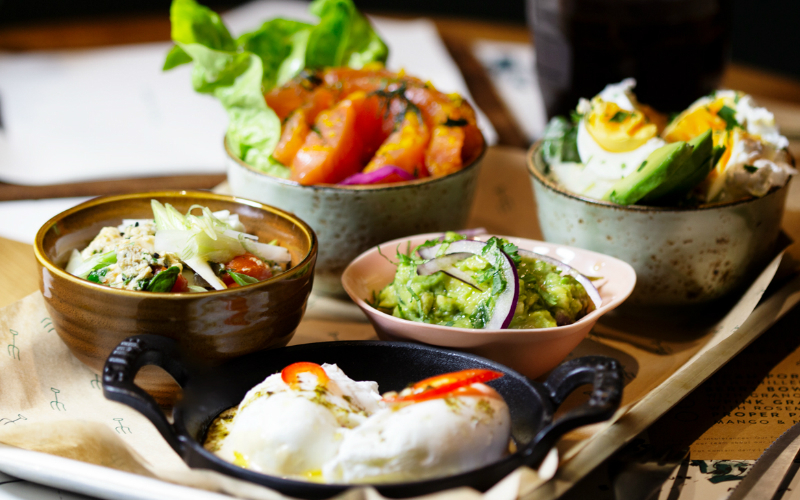 Roka can be pretty spenny but if you head to the Aldwych branch on a weekend and go for their Han Setto brunch you can try a huge selection of dishes without breaking the bank. Designed for sharing, the menu kicks off with a selection of pickles, edamame beans, and a bellini. The brunch continues with eight sharing dishes, brought out in no particular order, including a selection of sashimi, prawn tempura, beef gyoza, and salmon and avocado maki. AND if you think that’s brunch done, then think again as you also get the choice of a main course followed by the HUGE dessert platter which is Instagram heaven. A boat containing everything from a chocolate Buddha to panna cotta, fruit, truffles and a whole lot more. Add in unlimited wine, you know it makes sense. Aster only opened at the beginning of 2017 and they wasted no time getting into the bottomless brunch game. There’s a two-course and three-course option, plus an upgrade to bottomless bubbles for £15, and whilst you can get eggs or a hamburger, embrace the Nordic/French style of the place and go for something a little different – herring caviar with potato blinis, salmon with seaweed beurre blanc and confit duck leg with white asparagus are all winners. Brunch meets booze meets BBQ at HotBox. 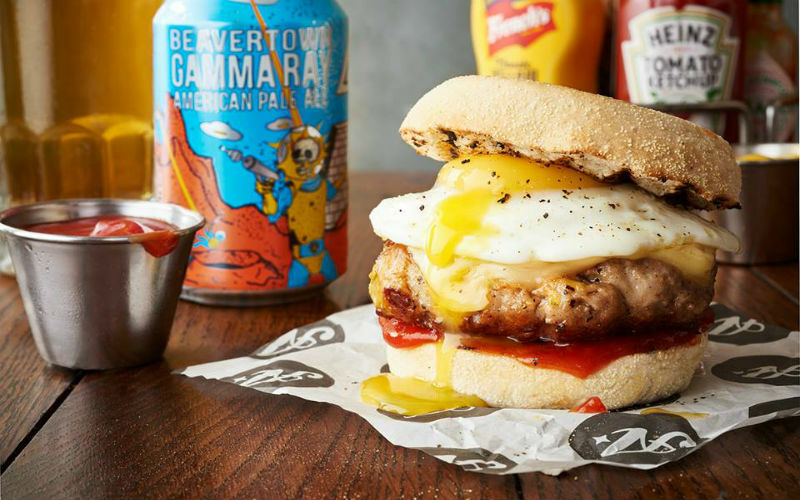 They do have the obligatory eggs and avo but this place is a meat lover’s paradise so do it properly and feast on ribs, smoked wings, brunch burgers and more. And the barbecue goodness doesn’t stop there; you can get five types of unlimited Bloody Mary including one made with smoke dripping if you don’t feel like going for bubbles. If you want to go all out for brunch, The Devonshire Club is for you. But forget the eggs, this place is all about THAT roast beef that’s carved table side from a trolley and comes with all the trimmings. And with a buffet for starters and desserts, you really can feast. For just £30 you can go all in and another £15 gets you bottomless prosecco, what have you got to lose? If you fancy bottomless brunch with an Italian twist, head to Hackney’s Martello Hall. 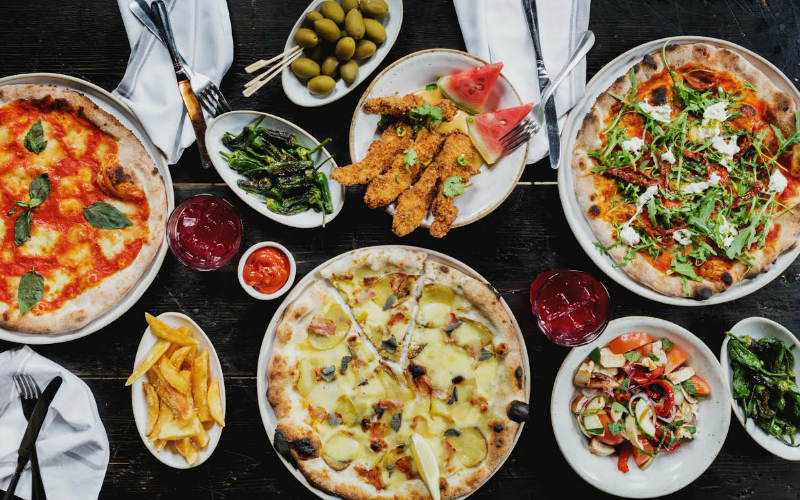 Not only does their Brunch Italiana menu include breakfast dishes like baked eggs and a bacon sarnie with nduja ketchup but it also features a range of pizzas and even sweet dough for desserts. Plus it’s just £15 to add unlimited mimosas, rum punch or Italian frizzante. If you fancy spicing up your bottomless brunch then make a beeline for Brigadiers. 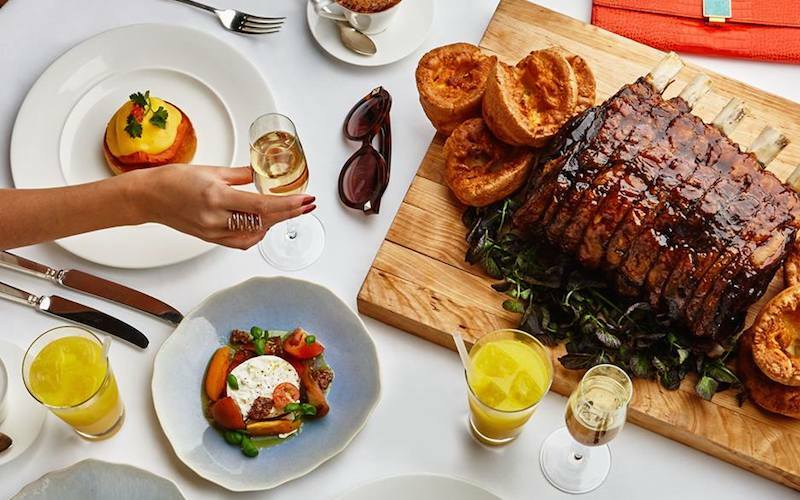 It’s actually more like a cross between a Sunday roast and a bottomless (absolutely no bad thing in our books) with a three course Sunday BBQ menu. 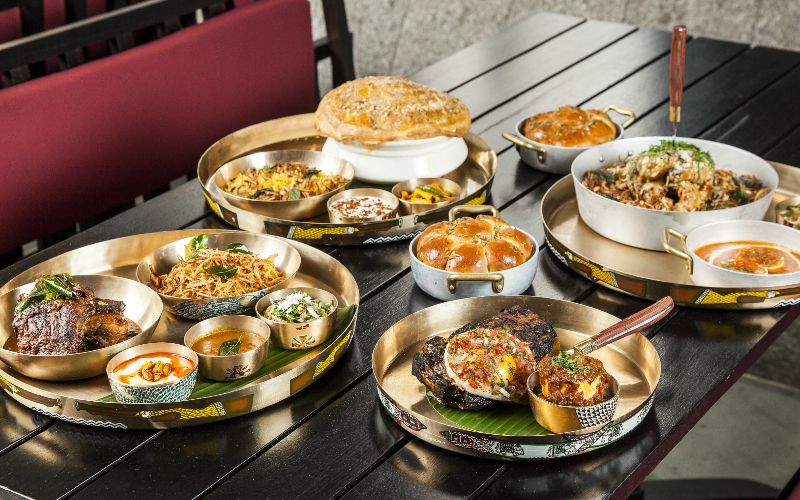 You kick off with a load of different pappadums and chutneys before moving onto the absolutely massive mains. The wood roasted Goan pork comes in a gorgeous sauce with masala rice and smoked mackerel sambal on the side but it’s the tandoori masala ribeye with its bone marrow dopiaza that’s an absolute must. Oh and you get tadka greens, crispy chaat masala tatties AND fennel buns on the side. And then you get kulfi for dessert, which thankfully is feather light so you can definitely fit it in. As well as making sure you’re incredibly well fed, the Brigadiers team will keep you watered with free flowing lager, prosecco or Paloma cocktails, and they are very on the ball when it comes to keeping you topped up too. 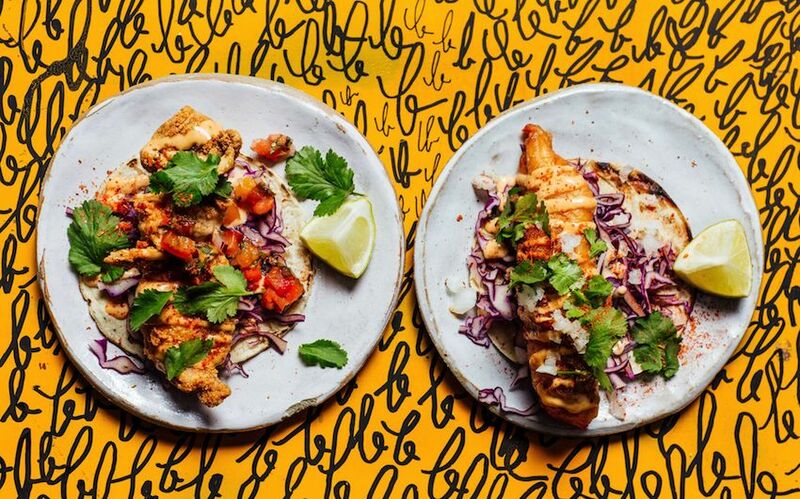 Del 74’s taco and tequila game is already strong and now it’s got in on the bottomless brunch action at the Dalston site with unlimited Bloody Marys and frozen margaritas. It’s only a short menu but it packs in the flavour alright. Tortilla chips and guac, with A LOT of that amazing green salsa on the side, is the only way should be starting here, and then you can go for more chips with the chilaquiles, where they’re covered in tomato sauce, sour cream, cheese and a fried egg. The enfrijoladas – corn tortillas topped with black bean salsa, cheese, sour cream and an egg – is also a great option, and yes, you should defo add steak to this. There’s also fully retractable windows in this joint so you can enjoy some Kingsland Road sunshine with your margs. If you like your bottomless brunches to come with down and dirty diner food, get yourself to Bad Egg pronto. 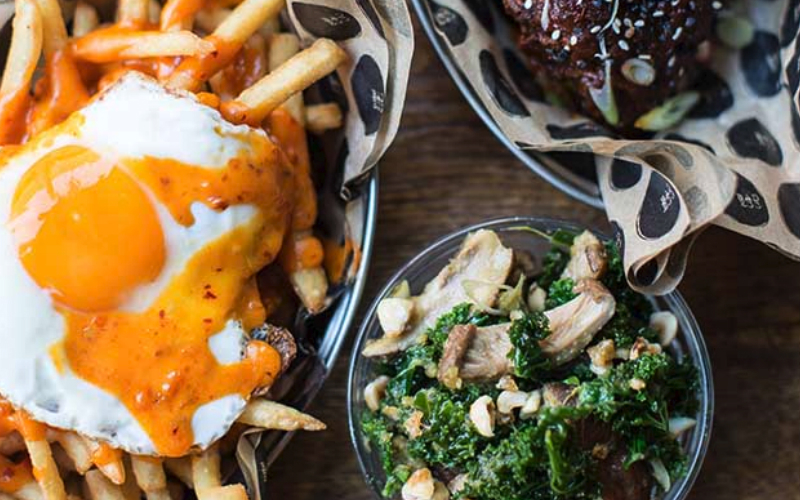 Back and better than ever after a six month closure, the Bad Egg brunch not only features unlimited Bloody Marys, mimosas or prosecco but the likes of breakfast tacos, mac & cheese balls with chipotle aioli, cheeseburger hash and nduja cheese and fried egg fries. Sounds egg-cellent right? It’s defo more lunch than brunch at LIMA but when the food is this good, who cares? 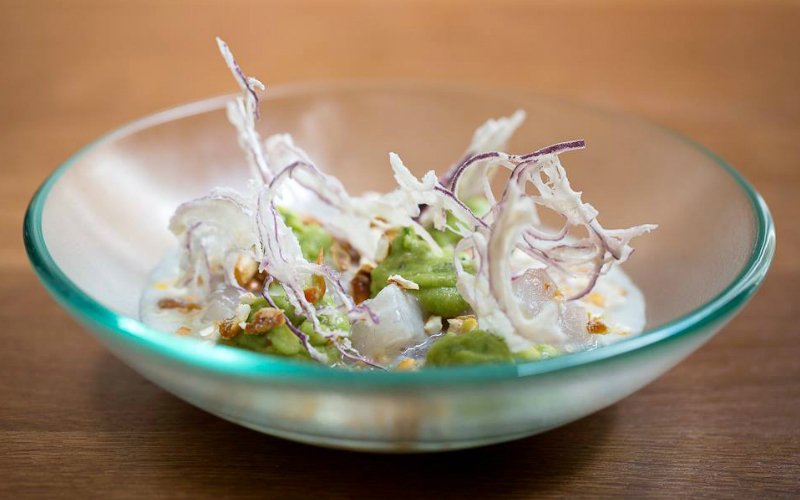 Your set six courses include mixed ceviche, beef anticucho, asparagus tempura, hake plancha with seaweed and corn and a whole host of other Peruvian delights, all of which are pretty as a picture. You can make it bottomless (prosecco, beer or pisco Marys) for £49, which is a bit of a steal considering this place is Michelin-starred. 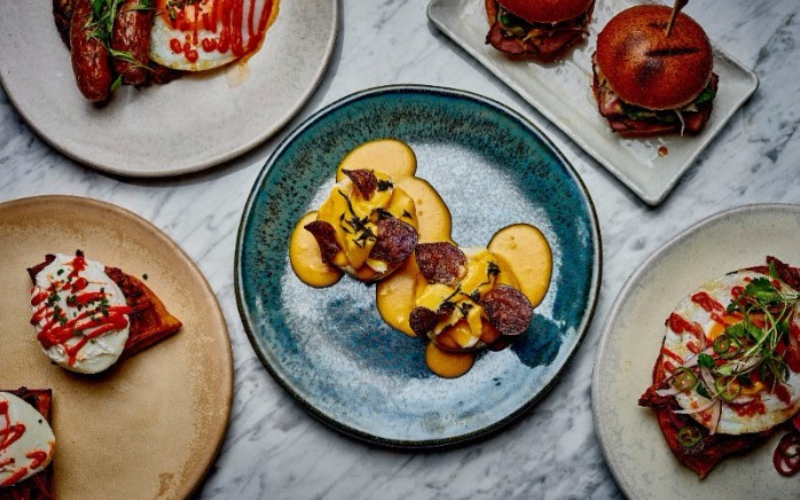 For a free-flowing weekend feast in the heart of Soho, Ember Yard on Berwick Street is the one with four courses and bottomless prosecco, red or white wine. With the menu changing fortnightly there’s no fear of regulars growing tired from their offering. The Cornish mussels with fino sherry and chickpeas is super fresh, amazing to look at and damn tasty and the smoked, slow-cooked Gloucester Old Spot pork is also AMAZE. And after all that prosecco the affogato with dulce de leche is quite the pick me up. £35 a pop served from 12pm through to 8pm every Sunday. Winning. Sometimes eggs and avo just won’t cut it and you need something more substantial – like a kebab – for brunch. That’s where Le Bab comes in. Really it’s more lunch than brunch as the Kingly Court spot has just added a bottomless booze option onto the side of their regular menu. But what a menu. The Le Bab bhajis – onion bhajis pimped with braised lamb shoulder and beef shin – are a must-order and the kebabs are just as epic. The 15-hour pork shawarma has a great crunch from crackling and pickled kohlrabi, whilst the BBQ paneer with beetroot puree, curry mayo, and crispy onions is a winning veggie option. Roll ’em up and stuff ’em in. The drinks options, prosecco spritzes made with either elderflower or raspberry, are the ideal accompaniment. They go down a treat and they’re not stingy with them either, just how we like it. Jones & Sons made the move from Arcola Street to a bigger place on Gillet Square last year so now there’s even more space for bottomless brunchers. They offer unlimited food and drink during each two hour sitting, which is about enough time for three plates – they have a range of egg dishes, avo on toast, waffles and french toast – and a whole load of prosecco. If you wake up one weekend and think what you really want is jerk chicken for brunch, then the Prince of Peckham has got you covered. White Men Can’t Jerk are the resident Caribbean connoisseurs in the kitchen, serving up an amazing array of jerk seasoned goodies to get you going and banish any hangover. We’re talking jerk chicken and waffles; a gigantic jerk sausage roll; a selection of meat and veg patties; jerk burgers; mac and cheese; corn on the cob with jerk butter – and it’s all absolutely banging. If you want to go one further you can even have bottomless prosecco for 2 hours for £18 per person. we’re not even jerkin’. For those of you out there that think sipping a Bellini is a bit too dainty or if you simply can’t stand the taste of tomato juice, never fear. Top somm-ALE-ier Melissa Cole has teamed up with All Star Lanes to create the bottomless brunch you’ve always HOP-ed for. 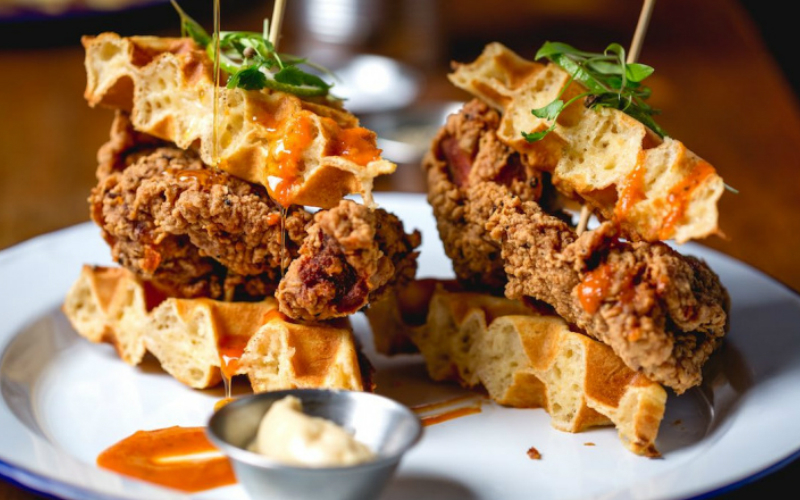 True to it’s American roots, the brunch menu offers a selection of stateside specialties like a salt beef hash with sunny side up eggs and the obligatory fried chicken with waffles, smothered in condensed butter with chilli, salt, maple syrup and topped with treacle-cured bacon. Each dish is then paired with a complementary craft beer such Brooklyn Breakfast Bourbon Hoptail or the Beavertown Gamma Ray which, as it’s bottomless, you can quaff to your heart’s content.